Here's the axle off my Aug 09. It locked solid on me back in the 80s and it's been siting in the shed waiting for me to fix it. Any thoughts on making a good job on it would be welcome. 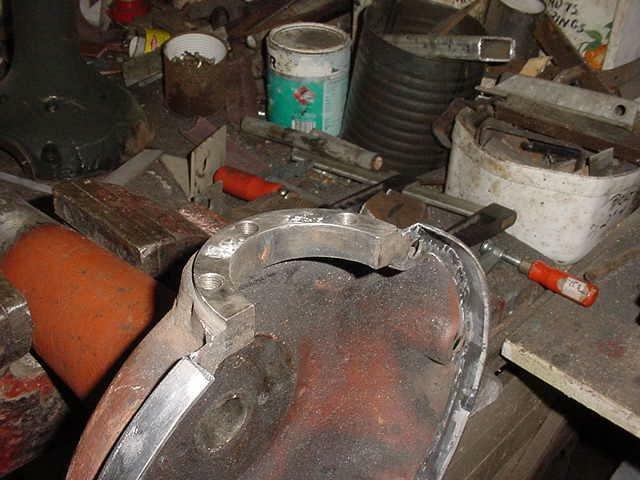 The driveshaft collar being brazed together, I would reassemble this with weld for maximum strength. 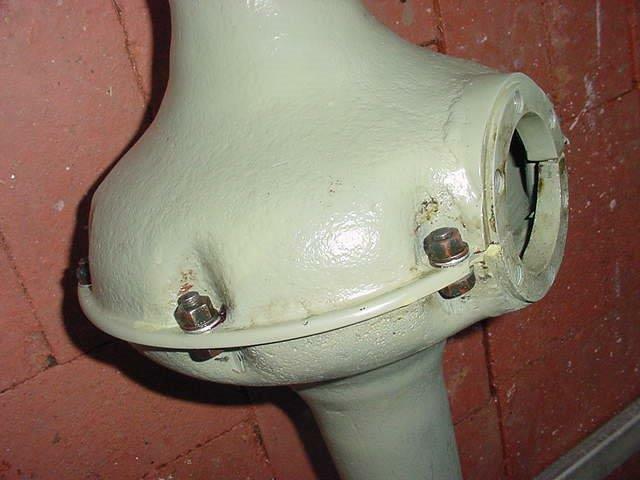 A fixture will be needed to maintain the collar positions as repairs are being conducted. I recommend any later pinion housing with increased inlet boss diamter for accurate positioning of the collar halves. After ensuring the axle housings are straight, I would bolt them together and create a fixture where you drop through a shaft through from one side to the other (essentially taking the place of the axles) and then come off the center with a perpendicular piece to project through the pinion hole. Now you have something around which you can build to maintain things as square-and-parallel while you reverse the damage and put the pieces back in place. It would be a starting point. My opinion. And I know some people will disagree with this. IF it was brazed before? I would braze it again. 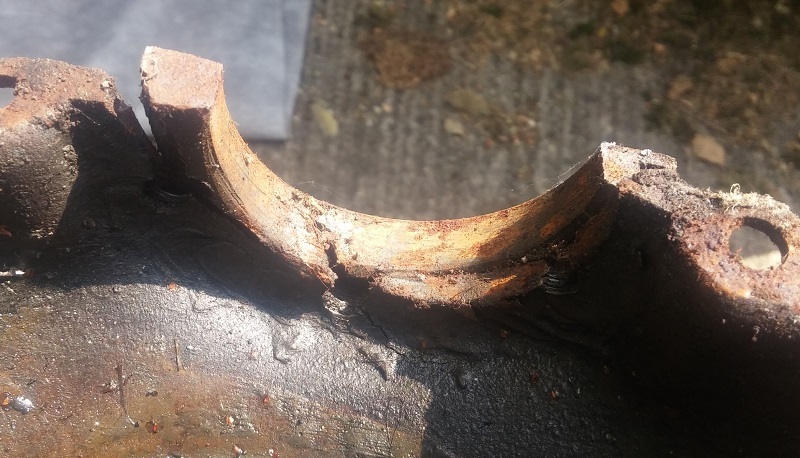 Number ONE reason for this, is that proper welding CANNOT be done over braze without grinding and cutting enough to remove one hundred percent ALL brass or other copper based material. The amount of welding required to replace all that removed metal will likely not be any stronger than a good brazing job. Grinding out some area for "V"s will be needed. Careful reshaping of damaged parts and jigs to hold straight and center are required. Lots of measuring and rechecking is a MUST! Except for serious cracking and significant separation, it doesn't appear to be in very bad shape. If it were mine? I wouldn't be afraid to fix it myself. I am trying to imagine what would have caused this damage. If you go at this with reversing the sequence of catastrophic events in mind, it may yield clues to how you go about the fix. I would probably set this up on a surface plate to get the case halves flat and square, and then proceed with something along the lines of Walter's suggestions. I would be interested to see how you do it! I am with Wayne on this, brazing is a must. Bolting both sections together is also a good plan for proper alignment. 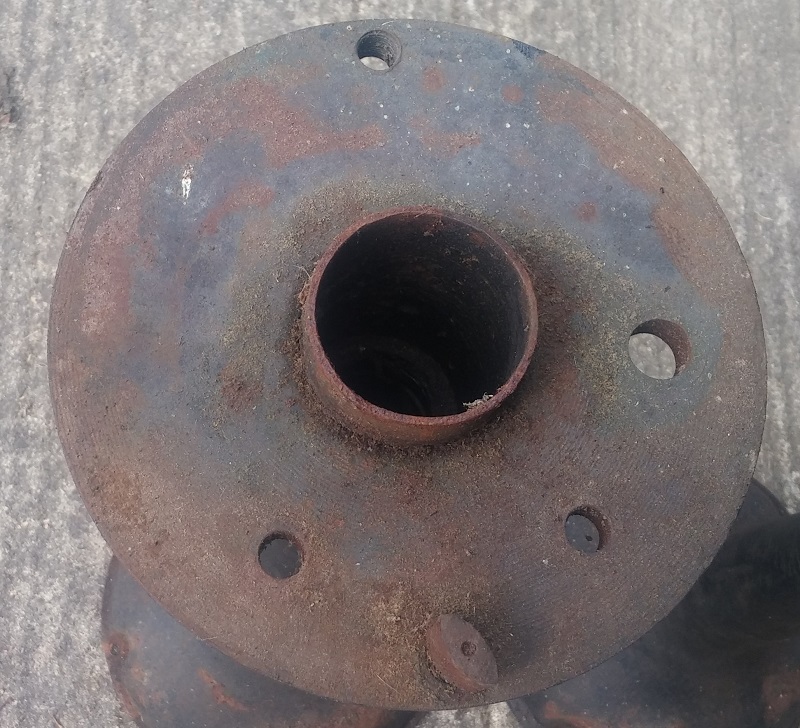 If you take a good any year set of rear end housings and what you have to a good machinest, he should be able to restore the surface for the threaded pinion housing insert and braze it in. There are lots of alignment things to do but all should be possible. I like Bill's idea of working out why. A lot of other stuff in my life back then stopped me from doing that. This has the babbit inner brgs, if they are worn to the extent that the crown wheel & pinion got totally misaligned and locked, that would have ripped it all apart. It was a catastrophic event, the radius rods are banana shaped. Or did one of those brazed-in sections pull away suddenly? It happened at slow walking pace but we were all thrown forward out of our seats. 3 hole collars are shot. You will need to turn those new. I hear what Wayne is saying about cleaning off the brass, but you need to do that regardless of how you replace the collars. Any way you do it, you are going to loose additional metal in the process. I would have my best welder TIG this with nickel/cadmium rod. If you have welded on one of the early pans, then you know why. I vote with Kevin. You will need to make a right angle jig to accurately position the driveshaft collar off the axle housing holes. Use the jig to locate the driveshaft collar and braze in place. Given the obvious weakness of the original design, I would say that a good hard stomp on the brake pedal, with a fully loaded car, would produce that damage. Thanks for posting the pictures. It's really interesting to see how the early stuff was made! 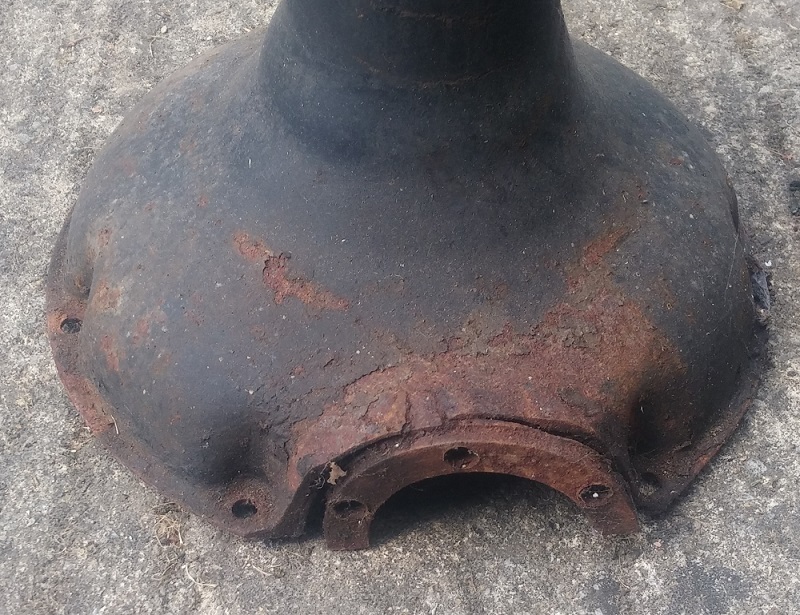 Here is an off the wall idea: Find a donor axle housing, it could be 1915 or later and slice off about an inch off the driveshaft end. Do the same less the saw blade thickness off your 1909 housing. Braze or weld the parts back together using the bell housing holes for alignment. You could experiment on a junk axle housing and develop your technique. Jem, most of those no rivet rear ends failed because the Babbitt drive shaft wore allowing the pinion gear to skip a tooth. I think you are going to make a new collar. It's hard to get rid of that old brass. I'd recommend you contact Dennis Oley in Redding, CA. He has made that repair before. I'll send you his contact info. I don�t want to sound like I�m volunteering... but making the collar and repairing the housing looks like a piece of cake to me. Also, I wouldn�t bother with any �alternative� fixes, the housing is special enough to warrant being repaired properly. Thanks gents, lots of inspiring help. I remember seeing (probably here) a drawing from the Benson Ford of a brace to stop the torque tube wagging the nose, also the later 6 rivets had a nose reinforcement. Years of braking & acceleration have clearly weakened the brazed joint. I will post photos after I clean it up. Pinion position appeared sloppy on mine where the collar id measured 2.645 and torque tube pilot boss is 2.625. I had to make the 6 special studs anyway, so I added a bushing diameter to each, just below the tube flange. Torque tube now fits together very tight...no potential for misalignment. I built the torque tube with a double row angular contact ball bearing instead of the OEM bushing, this also with the intention of positively insuring the pinion position. Maybe overkill, but decided to be too precise rather than risk alignment movement. I built the torque tube with a double row angular contact ball bearing instead of the OEM bushing, this also with the intention of insuring the pinion position. Maybe overkill, but elected to err on the side of caution. Pardon the double post...I guess I stutter when I type. Wayne is 100% correct. Once brazed, re braze. Could a new casting be done? Bud. A new part can easily be machined and brazed in. I probably would finish after it was brazed in. Jem More photos of your car please. Walter, Is your 11 finished, more photos please. I had a simular problem with my 09 some years ago. one side was just as damaged as yours. They weld very easily and I wouldn't let the brazing stop you from trying. I found very little brazing in mine. I simply built it all up with mig weld and had it machined and file finished the outside to a simular finish to the good one. All I could find at the time were 3 right housings, so I made this one into a left housing. Here are some photos of the finished machine work and unfinished lip. I have worse center sections like that. I want to re-create the whole thing with. Except mine were cut off like jackstands too! I've seen threads about truing them up in a lathe. Has anyone here done that? Thanks Mark. You sent me a lot of info back when I originally had the problem, I printed it off and should still have it in my (disorganized) archive. Here is how I trued them. A simple frame I welded up. Made some plugs with centres in the lathe for each end (Make sure to drill some sort of hole beside the centre of each plug so you can knock them out after your finished). Used a surface gauge to find the out of true. Used tiny "red" heat shrinks and a wet rag to bend the housings. Too much heat will have very little affect in moving the housings. The mating surface may need some heat and hammer work. Brazing is like a metal glue. Well, some types of glue. Unlike good wood glue, and epoxies on broken ceramics, brazing does not penetrate the irons or steels. It simply sticks to the surfaces (like solder does). 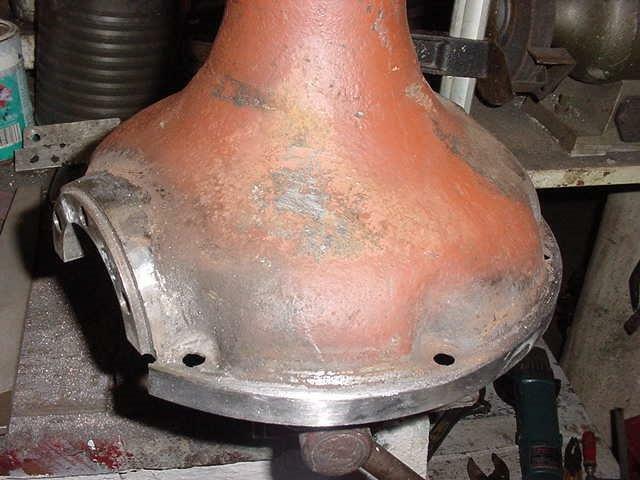 Proper brazing does NOT get the iron or steel hot enough to melt, just red hot enough for the braze to flow across surfaces and nicks and crannies to become stuck and hold the pieces together. Brazing, brass or bronze, uses various alloys of metals such as copper, tin, zinc (and a few other lesser amounts of other things) which combined create a combination of flowing, sticking, and final strength characteristics. What is amazing about this, is that some of those metals (especially the copper), while wonderful as a brazing material, are absolute POISON in even minuscule amounts when alloyed with iron or steel. Vanadium, it is not. Even a few molecules containing those elements can render steel as brittle nearly as glass. Welding requires the melting of the metals and flowing together to form a new alloy in the area being put together. 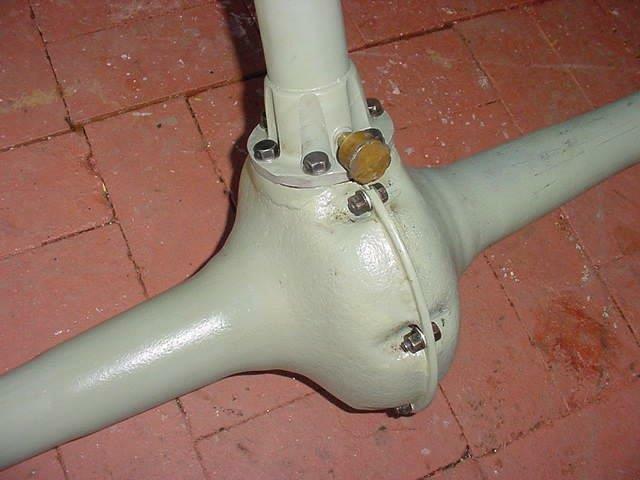 Any amount of brazing material left behind in the area will result in a "weld" with no strength whatsoever. 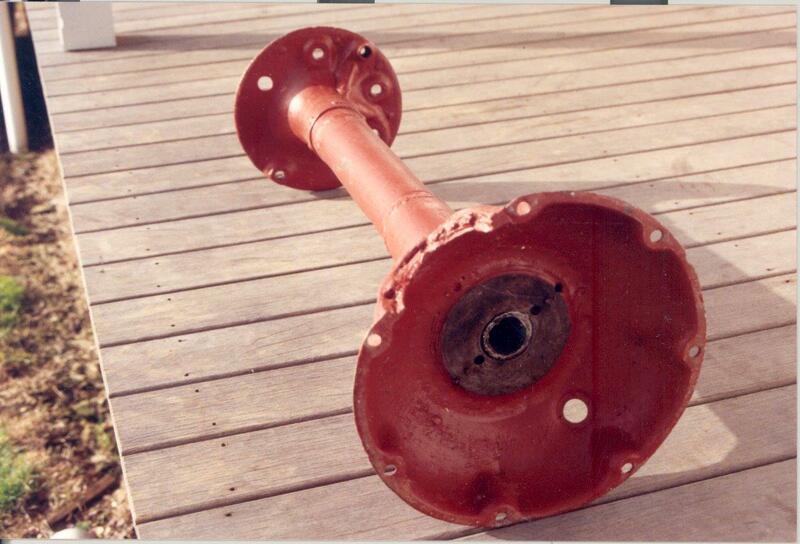 Some years ago, one of the speedsters I restored required a special short drive shaft and torque tube. I had an odd, and slightly damaged, torque tube. Perfect for cutting down for a special short version. But, as I said, it was an odd one. Probably some after-market replacement from Somewhere Auto or something. 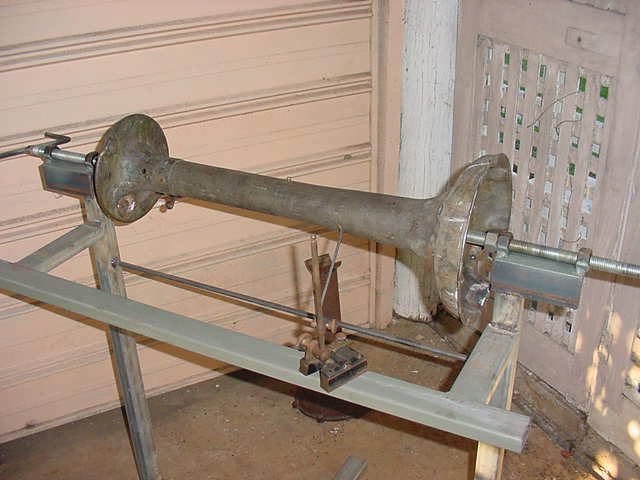 The tube was originally brazed the entire length. I looked at it, thought about it, was well aware of the risks of attempting to weld near brass. Cutting out the damaged area was perfect for the short length I needed. But I still liked the idea of actual welding for the major strength. So, pieces cut, I cleaned the area to be welded quite well. At least I thought I did. I welded about two thirds of the way around the tube. Ground it nice and pretty, "V-ed" out the remaining third, and brazed across the area that had been brazed originally. Finished up, it looked nice and seemed to work fine. For awhile. After about two years of driving, tours, and two endurance runs, I noticed oil forming on the paint of the torque tube. Sure enough. The weld had cracked more than half way around. The braze was still holding it together. Repairs involved more grinding, more brazing, and a small gusset. I might have bet the farm I had that area clean enough of brass?! Clearly, it wasn't. Curious what welding technology you were using for the failed weld? Was this TIG welded and did you use a steel alloy rod? Pardon the drift here Jem...Vanadium welding has been a constant head scratcher for me, and I question whether Wayne's experience and circumstances of this particular part may be a similar episode. Notice that Wayne is quick to point out that this was not a Ford torque tube. 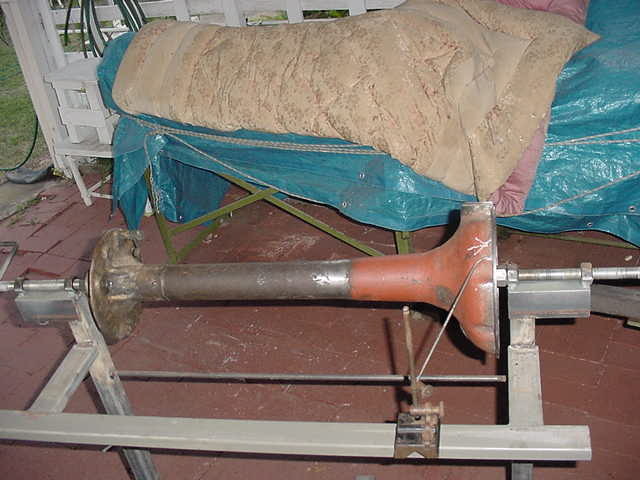 It is also stated that it was brazed the full length of the tube. Am I hearing that the tube was rolled and brazed with a lap joint down the length of the tube? This may have been assembled this way intentionally from whatever factory it was made in because of the designed material used. The answer could simply be that the steel used to form the tube was �leaded�. Typically �leaded�steels are non-weldable, but are great for forming operations as they are less prone to cracking and resist work hardening. Also, if you used a MIG welder, and it were made from chromoly steel, the weld would have cracked before it would have cooled unless proper care were taken to pre/post heat to relieve stresses. There is truth to Wayne�s comments about weld contamination, and how it can dramatically affect weld strength. But if you don�t know what material you are starting with, it�s all just a guess how it�s going to turn out in the end. For whatever it is worth, I am "old school". Mostly taught by my father, and I mostly to this day use the Smith Gauge set he bought about five years before I was born. I did take an adult education course in machine shop (I have the certificate to prove I am a trained "certified" machinist!) (that is a joke, by the way), and the course did include welding of many types, but that was over 45 years ago. So I do have some training with TIG and MIG, but no practical experience. Most of my welding is oxy/acetylene as it is what I am comfortable with, and it works well with most of the forming and metal work I usually do. I also have my dad's Lincoln AC "buzz box" which I can and do use occasionally for heavy duty welding. But I never seem to do it enough to get and stay really good with it. The last time I even held an "inert gas" or "wire feed" welder was over 45 years ago, in that class. That torque tube was a mystery. I have often wondered about the material involved. 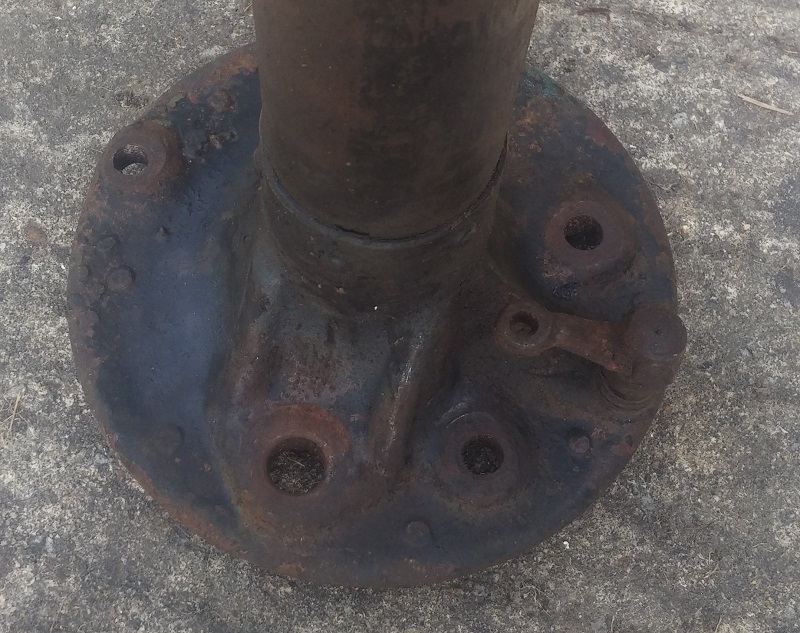 It seemed to weld nicely, but what actual alloy it may have been? I have often wondered. Whether the crack was due to some bizarre alloy? Or copper contamination? I really do not know. Kevin P, Yes, it was rolled, and brazed with a lap joint the full length. All these years, I have only spotted a handful of similar torque tubes at swap meets, making me believe it was some sort of oddity. What kind of "steel" was used? As I said, I have no way of knowing. It seemed to weld nicely, but some alloys do not mix well (usually, I use a standard mild steel rod). The weld cracked, but the inch and a half I had brazed afterword held nicely. My re-repair was gusseted and brazed. Several years of Endurance Runs and hard driving later, when I sold the car, it still looked good.